A ONE-DAY WORKSHOP PRESENTED BY PAUL TARAS WOLKOWINSKI AND HOSTED BY JOHN PARKER AND MESA RIM CLIMBING AND FITNESS. This is the most fundamental and in-depth Traditional Gada (mace) workshop available in a single day. This workshop is ideal for newcomers to the Gada (mace) and also those who have been training but want to refine and perfect their technique. Swinging a Gada (mace) is a full body workout that will strengthen your back, chest, core, shoulders, forearms, and grip. 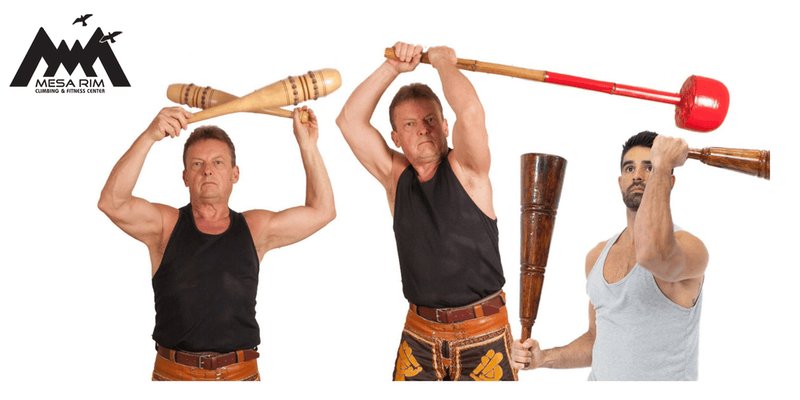 Swinging the Gada (Mace) is a Mental and Physical Challenge, it is clumsy, unbalanced and intended to be difficult to handle. The Indian Club content in this workshop is highly focused on transverse turns, thoracic mobility and grip changing which are prerequisites to understanding the mechanics of Indian Clubs and the Gada (mace), as there are many crossover points and common threads in the two disciplines. As an added bonus, you’ll get to take home your own set of clubs and a Gada. That’s a $120 value! Check out the clubs in action, courtesy of Mesa Rim personal trainer and workshop co-host, John Parker, CSCS. Want to learn more about how Indian Clubs can help you build stronger, more stable shoulders? Check out this informative post written by event co-host, John Parker.